Ischia Thermal Dol cream is a natural remedy against joint and muscle pain. Ischia Thermal Dol cream is a natural remedy against joint and muscle pain. In addition to water from the hot mineral springs of the island of Ischia, famous for its anti-inflammatory properties, the product also contains other important ingredients, including Capsicum Frutescens Oleoresin (black Cayenne pepper), which has thermogenic properties; Methyl Nicotinate, which improves and favours circulation (as can be noted from the typical redness that appears on the skin) and is well known because it is also used in numerous anticellulite products; Eucalyptus Globulus Oil, which has antiseptic, regenerating and stimulating properties; Rosmarinum Officinalis Oil, which has a unique antiseptic action; Salvia Sclarea Oil, which treats spasms and is antiseptic. 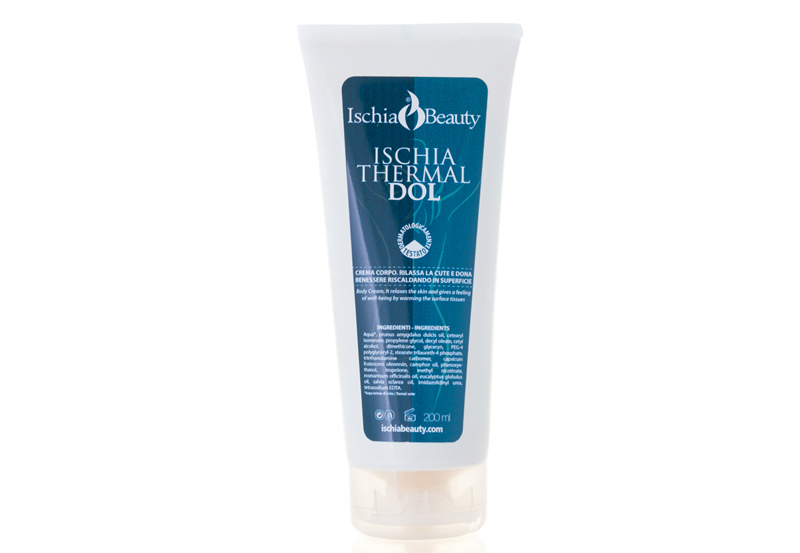 Apply Ischia Thermal Dol to sore areas during spa treatments and at home. Various ingredients will stimulate blood circulation, causing harmless surface redness. However, it is best to avoid the sun and sources of heat for at least two hours. Instructions for use: distribute on the required areas, (shoulders, thorax, legs, neck, superior and inferior limbs etc.) at least twice a day, doing it with a light massage. Ideal for sportsmen. Apply before physical activity, to facilitate the warming of the muscles, preparing for physical force. Applied after sporting activity, gives and loosens the muscles in less time. Avoid contact with eyes and mucoses. In case of undesidered contact, rinse with plenty of cold water. After application wash your hands well. Ottimo prodotto per lenire dolori muscolari, grazie al "friccico" iniziale che attiva la circolazione e riduce il dolore.